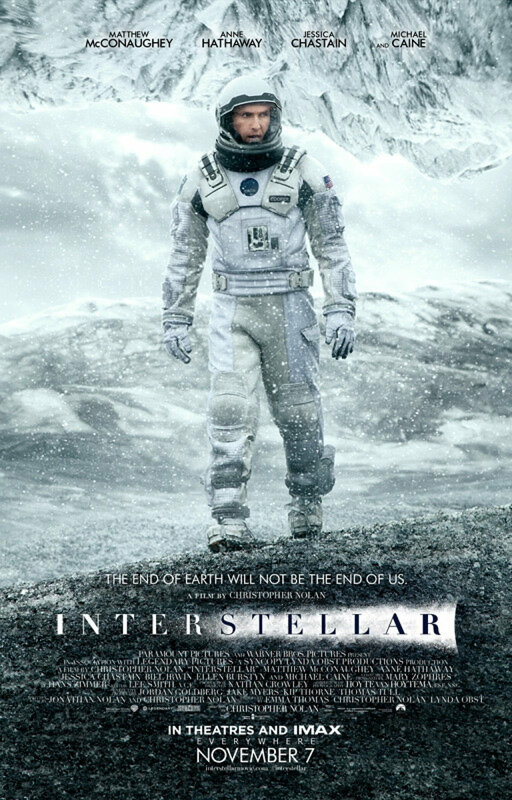 Single Sentence Review: Chris Nolan does space ships, math, robots and love. In the near future, humans have run out of food, and the survivors have been conscripted into agriculture. Cooper (Mathew McConaughey), a former engineer and pilot, has high hopes for his son going to college, but very few humans are allowed to go on past high school. The federal government is gone and local communities govern themselves. In general, humans have stopped killing one another over things. But the food crops are getting smaller and smaller. Humans are going to die. Cooper discovers gravimetric fields on his land with coordinates embedded in them. When he follows the coordinates, he discovers a space ship aimed at a wormhole orbiting Saturn. Who sent the coordinates? Who built the wormhole? Why? These are the central questions of Interstellar. As fun as this story sounds, the conflict in the first act feels forced. Some of the characterization falls flat, and the plot seems to break up in order to catapult the characters into space. The space parts of the film are wonderful to behold, and are refreshingly shot in 2D. The set design, color and light are lovely. Cooper and Co. find that there are twelve systems the wormhole leads to, each previously reconnoitered by a human astronaut for possible colonization. Based on their fuel and proximity to a black hole, they must decide which planet or planets to explore. Proximity and entry to a black hole, the force of love being able to transcend four dimensions and a MacGuffin, in the form of a quantum mechanics equation, combine to reduce suspension of disbelief for small portions of the film. But that’s not what the movie is about. When traveling at relativistic speeds, where hours spent exploring equate to years on earth, how does one maintain personal relationships? Is the expedition completely doomed from the start, along with the rest of humanity? When you return to earth, where your children have grown to be older than you, how do you relate? Interstellar shows us beautiful vistas and scientific curiosities but in the end, the connection between people is what the film covers. Successfully.